On June 7 at Madison Square Garden, one of the biggest boxing events of 2014 is taking place between Miguel ‘Angel’ Cotto and Sergio ‘Maravilla’ Martinez. This matchup has been brewing for the past couple years, and it has finally come to fruition. There are so many questions to be answered, and they will be answered on the night. It’s Cotto’s first fight at middleweight (159lb catchweight), so how will his body cope in the new weight class? Cotto’s been in many wars, does he still have enough left in the tank to compete at the elite level? Albeit he’s had less wars, Martinez is also aging, and the big question is whether his knee will hold up, or will it be hinder his athletic style like it did in his previous 2 fights? In this article, I’m going to provide a brief breakdown of each fighter, what they will have to do in order to win on the night, and finally, my prediction on who I believe will win. Although he’s a small junior middleweight, Cotto is still physically strong and does hit hard enough to hurt his opponents. Whether he will carry his power up to middleweight is another story. Cotto is a seasoned veteran and an all-round fighter who has fought the best of the best throughout his career. Nevertheless, he has many weaknesses that Martinez can surely exploit. Cotto must bang to the body and hips when he gets within range. Left Hook to the Body – This is his money punch, which has knocked many guys out. Now that he’s hooked up with new trainer Freddie Roach, Cotto’s left hook is a major focus, after failing to effectively implement that punch in several fights preceding training with Roach. Powerful Jab – Though Cotto’s jab is not very fast, it’s sharp, heavy and accurate. However, it will be difficult for him to establish his jab against Martinez, who has faster hands and a longer reach. Inside Game – Cotto’s stocky frame allows him to muscle bigger opponents on the inside and push them back. When he gets inside, he punishes his opponents with vicious body shots mixing it up with heavy head blows. Many fighters have succumbed to Cotto’s relentless pressure. Cotto’s head often remains too stationary. Stamina Issues – Cotto is strong and dangerous within 9 rounds, but tends to fade in the championship rounds. We saw this against Margarito, Pacquiao and Mayweather, who all either stopped or hurt Cotto late on. This should be a major concern against Martinez, who has shown that he can get stronger late on in the fight. Little Head Movement – When Cotto comes forward or when he’s stationary, he has little head movement, which leaves him vulnerable to counterpunches and straight shots, both of which Martinez excels at. It’s only when Cotto’s hurt or on the defensive, that he tends to try and avoid punches. This will be a very tough fight for Cotto to win. However, if Martinez’s legs have not fully healed, it’s a winnable fight. Easy to say, much harder to do. Although he has managed to do it against his previous opponents, Martinez is bigger, faster and a better outside fighter than practically all of Cotto’s past opponents. However, the times Cotto’s able to get within range, he needs to take advantage of Martinez’s low hands. Martinez gets flustered when his opponents are able to get inside and throw combinations. He doesn’t cover up very well and often leaves his right arm down, even when he’s in the danger zone. Blast out straight right upstairs (not one of Cotto’s strong punches) followed by the left hook, both punches that knocked Martinez down in the Chavez Jr. and Murray fights. Cotto is the smaller man, but he’s physically strong and should be able to hold his own on the inside. If he does manage to get close, he absolutely needs to bang Martinez’s body and hips viciously in order to slow down his movement. Cotto is naturally an aggressive fighter who has good boxing ability, a style which poses problems for Martinez’s style. If he’s able to maintain consistent pressure for 12 rounds, then it’ll likely wear down Martinez, just like in the Chavez Jr. fight and also against Margarito (I know it was 14 years ago, but Martinez still makes the same mistakes, the only difference now is that he’s bigger and stronger than back then). Again, this is a difficult task since Cotto is the smaller man with a weaker chin, and tends to fade late. This is the reason why it’s so important for Cotto up the ante the few times he’s able to get inside. Gifted with elite athletic abilities, Martinez has often been able to outlast and outblast his opponents. He has quick feet, fast hands, hits hard, and has a style that most fighters find difficult to crack. However, this also comes at a price, as the same athleticism that has helped him, has also hindered him as he has gotten older with age. Martinez needs to aggressively counter Cotto’s jabs and left hooks with his sharpshooting straight left. Athletic Southpaw Style – Martinez utilizes his quick feet to move around the ring to avoid punches and set up counters. 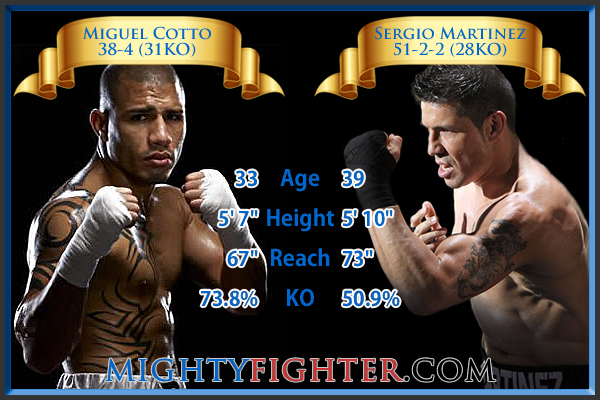 With his reach and speed advantage, Martinez can pick Cotto off from the outside. Quick and Powerful Left Hand – Whether it’s a straight or looping overhand left, both are quick, accurate and powerful. The straight left is Martinez’s main power punch, which has torn up many of his opponent’s faces. Fast and Sharp Jab – Martinez’s jab is a deadly weapon which is hard to see coming since it’s so fast and comes from below the waist. He also uses it as a power punch, usually coming immediately after he throws his straight left. Martinez is often off balance and keeps his hands down, even when his opponent is within range. Relies On His Athletic Ability – We all know what happened to Roy Jones Jr after his athleticism began to fade. The same thing can happen to Martinez too. He always keeps his hands low and so far, he has been able to get away with it because of his ability to quickly get out of range. But what happens when his legs fail him? He got knocked down and hurt in the Chavez Jr and Martin Murray fights because of this weakness. Off-Balance – The knockdowns that Martinez suffered in his fights his Paul Williams I, Kelly Pavlik, Matthew Macklin and arguably Martin Murray, were all results of poor balance. Either his feet got tangled or were too squared up. Plus the fact that he’s constantly on the move doesn’t help. Martinez holds the advantage in nearly every department. He’s the bigger man with the longer reach, he has quicker hands and feet, he has better timing and hits harder at that weight class. He needs to utilize all of these attributes in order to make easy work of Cotto. This will likely be Martinez’s strategy anyway. I cannot imagine that he’ll want to mix it up inside, unless he’s extremely confident that he can manhandle Cotto inside. Unlike Chavez Jr., Cotto will punch with Martinez should they go toe-to-toe. Martinez should stick to what he does best, and pot shot from the outside with 1-2’s. Martinez is a counterpuncher, but sometimes he waits too much. This will allow Cotto to get his punches off first, and become more confident. Martinez needs to make sure that he wears Cotto down with aggressive counterpunching. He needs to set up his counters with his jab and right hook, and throw his straight left when Cotto jabs or marches forward. At times when Cotto remains stationary, Martinez should pepper him with an array of punches. Pacquiao and Austin Trout (both southpaws like Martinez) enforced this tactic effectively time and time again. Looking back at Cotto VS Pacquiao, there were a lot of feints used by Pacquiao to bring down Cotto’s left hand, which opened him up for the jab and right hook from a southpaw stance. Martinez can easily employ this tactic and with the significant reach advantage, he should have no problems landing either punch. Assuming that Martinez’s knee is at 100%, this should be somewhat of an easy fight for him. Even if his knee is not fully healed, Martinez should still win this fight handily due to his superior size, reach and speed advantages. The factors that will seriously hold Cotto back in this fight are his shorter reach, lack of defense and tendency to fade in the later rounds. I don’t believe that Martinez will blast out Cotto, because he has proven to be a durable man with a lot of heart. Both his stoppages (to Margarito and Pacquiao) have come by TKO, and I also see the same result here. Martinez will pepper Cotto with jabs and straight lefts from the outside and really cut up his face. It will soon dawn on Cotto that it’s very dangerous to get on the inside, as he’s going to eat a tonne of counterpunches for his efforts. It’s very possible that Cotto will get dropped with a punch he doesn’t see coming, but he will get up and continue to fight, as he always does. It’s also possible (but less likely) that Cotto will drop Martinez and if he does, it will probably be due to bad balance. When it’s all said and done, I see either Roach, the doctor or the referee stopping it late on in the fight due to the amount of punishment Cotto has endured.